Is this Pandanus odoratissimus? It has white thorns on leaves in the picture.mi did ask them and waiting for reply. aykhan wrote: Is this Pandanus odoratissimus? It has white thorns on leaves in the picture.mi did ask them and waiting for reply. Dr. sb the picture reads "Pandanus tectorius". I guess it is also fragrant. But he is showing a female plant. The ideal way to get a Pandanus is that we find someone in Pakistan who actually has a male plant and we request/ buy an offshoot. I know it is a rare plant but as we say dhoondnay sey to khuda bhee mill jata he. This will ensure that we have a male flowering plant. I am sure someone in Pakistan must have it...our network here is very small unfortunately. May be you can post this on facebook gardening forum to increase the chances of finding someone having this plant. I purchased seeds from seedvendor of India on eBay for pandanus odoratissimus. They are 10 seeds and should arrive soon. Hopefully some of them will be male! aykhan wrote: I purchased seeds from seedvendor of India on eBay for pandanus odoratissimus. They are 10 seeds and should arrive soon. Hopefully some of them will be male! Sure why not, there is a high probability of some seeds being male. Can you share the link of that vendor? Plant commonly known loclly as Pandanus is shown above.It is of two colours,variegated & pure green. The variegated is a very common plant & must be an invariable part of any landscape,whether in green areas or a home garden. I have always been looking for a frangrant one among these,but obviously could not have found one, since it looks from the earlier discussion that the actual fragrant plant Pandanus or Screw Pine or Kewra is a different plant. 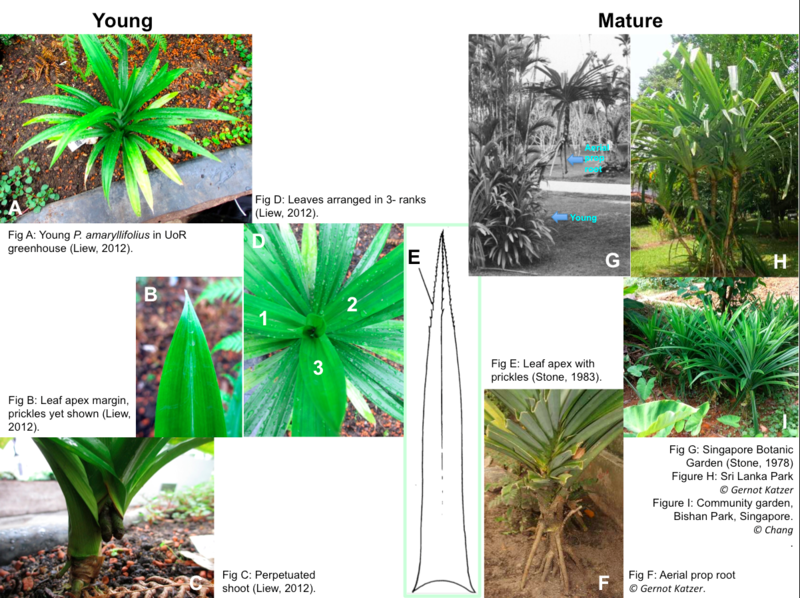 Comparison of( the appearance of) the two shows that local Pandanus plant has similar leaves, but these originate from the ground( not visible in the above picture) rather than from a single stem as in case of the Screw Pine plant shown in this thread. @ Dr AYKhan, glad to know that you have managed to get the seeds.Could you kindly share the details, as I also want to get these. Munir sahab, most likely Pandanus amaryllifolius... but probably not the one we are looking for. I am also interested in buying this plant but the vendor AyKhan shb mentioned has some issues. Pakistan is not listed as one of the possible shipping countries ...if you use a PC...not sure why. Can you take some pick few leaves of your plant and let them wilt? They should become fragrant within a day or so. Fresh leaves, from what I have read, is that the leaves become fragrant like Basmati rice on wilting. Leaves, always used fresh (slightly wilted). The aroma develops best after about two days of drying; however, if fades within a week after that. Dr Sb,an update is requested. Sir it's been more than a month and I have not received the seeds. Sorry to hear that----- Good luck for their early delivery.Do give us a brief on receipt.